This book was tailor made for those of us who, when we were kids, watched 'McHale's Navy' and the movie 'They were Expendable'. We were also shown and taught about the exploits of President Kennedy and the PT-109. The PT boat was part of us growing up. Sure, 'McHale's Navy' was a comedy, but it did show what these small, almost shark-like, fast boats could do. 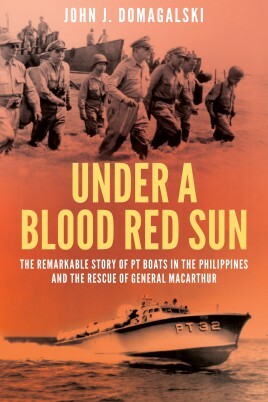 This book is about the men and actions of Torpedo Boat Squadron 3, based in the Philippines. They were almost the only navy ships and sailors the U.S. had on hand when the Philippine Islands were invaded by the Japanese in 1941. This book is about their fight at long odds and their greatest achievement in bringing General Douglas MacArthur to safety, on orders from the president. Their 560 mile trek through Japanese patrolled waters to get MacArthur and other generals to safety was a long nightmare of bad gas and close calls. PT type boats were used by all of the major naval combatants in WWII. It was designed to give a small ship a mighty punch. Armed with two to four torpedoes and machine guns, these featherweights packed a heavyweight punch. A torpedo hit, especially one in the right place as in the Bismarck, could seriously compromise even a battleship. They were only six little ships to take on the might of the Japanese invasion force. All six of the ships were eventually lost to enemy fire. Their end was almost a foregone conclusion, but the battle they put up before being lost is the stuff that legends are made of. One of the problems that the U.S. Navy suffered with in the beginning of the war was with faulty torpedoes. The PT boats did score hits on vessels, but unfortunately the Japanese war records show no loss of ships. Their commander was Lieutenant John D. Bulkeley. His story, and the crews that fought with him, was front page news in 1941 and into the war years. Sadly, their fight against an overwhelming enemy has been relegated to the bottom of piles of old newspapers if remembered at all. They deserve to be remembered just as much as the 'Tin Can Sailors' from Leyte. The author, John J. Domagalski, should be thanked for bringing the brave men and their tough little boats back into the limelight. 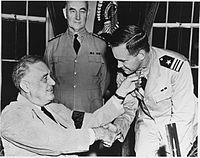 The heroics of the PT boat men helped to award Lieutenant Bulkeley the Congressional Medal of Honor, among other medals, and he was touted in the U.S. early in the war as one of our first heroes. He went on to have a long career after the war and was retired as a Vice Admiral. The movie, 'They Were Expendable', also had some strange history to it. Robert Montgomery, who was tapped to play the part of Bulkeley, was also a PT boat skipper during WWII. One does not "win" the Congressional Medal of Honor. It is awarded. Sounds like semantics, but it is a key factor in understanding the humility of those who have received it. They did not ask for the award, they did not compete for it. It was awarded to them for their selfless acts in the face of overwhelming adversity. You are quite correct. It has been amended. I am glad you liked the review.